Tenderfoot Lodge in Keystone Colorado Real Estate is steps from the Mountain House base area of the Keystone Ski Resort. These Keystone condos are located along the serene banks of the Snake River and the Summit County bike path. Tenderfoot Lodge condos all have river and ski area views from their living rooms and decks. As one of the newer condo complexes in Keystone they offer some of the more spacious floor plans with nicely appointed finishes. Built in 1996, Tenderfoot Lodge in Keystone CO has 72 units comprised of 9 – one bedrooms, 51 – two bedrooms and 12 – three bedroom condos. Amenities include a heated garage, elevators, lobby with stone fireplace and televisions and outdoor hot tubs. While being close to the ski lifts, Tenderfoot Lodge does not have a Keystone transfer tax or any additional neighborhood fees. 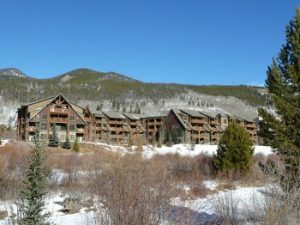 When considering a condo in Keystone CO Real Estate take a look at the condos for sale in Tenderfoot Lodge.